Beaded and/or quilled pipe bags were among the most elaborate items made by American Indian women of tribes across the United States. 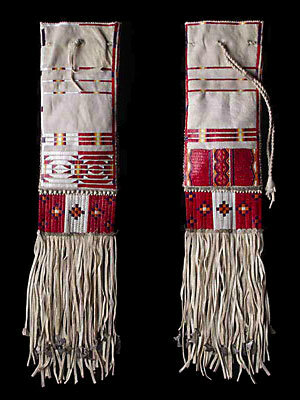 Bags were made to hold sacred items and were decorated to tell stories and visions associated with their owner. Tobacco was carried in the bottom of the pipe bag in another small bag, with the separated pipe bowl often laid on top facing up. The stem was placed along one side of the bag or was sometimes placed in its own specially constructed separate section in the bag. Each bag had a thong string tie attached to the top to secure the contents of the bag. This particular type of bag was made for the woman who, driven by her dreams, went on a vision quest. Upon completing her journey and returning, she was given such a bag to use in her capacity as a healer. One side of the bag has a solidly quilled section that represents the medicine woman and her triumph at becoming such a person. The design shows her healing abilities, her life's choices, and her dedication to her people as a healer. The back side of the bag represents her husband's life with her. It shows his deeds as a warrior and the stature that he holds. The white represents his heart and the red represents his life. The geometric designs represent his exploits in war parties, horse-stealing parties, counting coups, and so on. The bag as a whole indicates the importance of the woman and man and how intertwined they are in life and in heart. Although this particular pipe bag is a modern piece, it was made by Anthony P. Horse Road, a Sicangu Lakota, in the style of 1750s pipe bags.